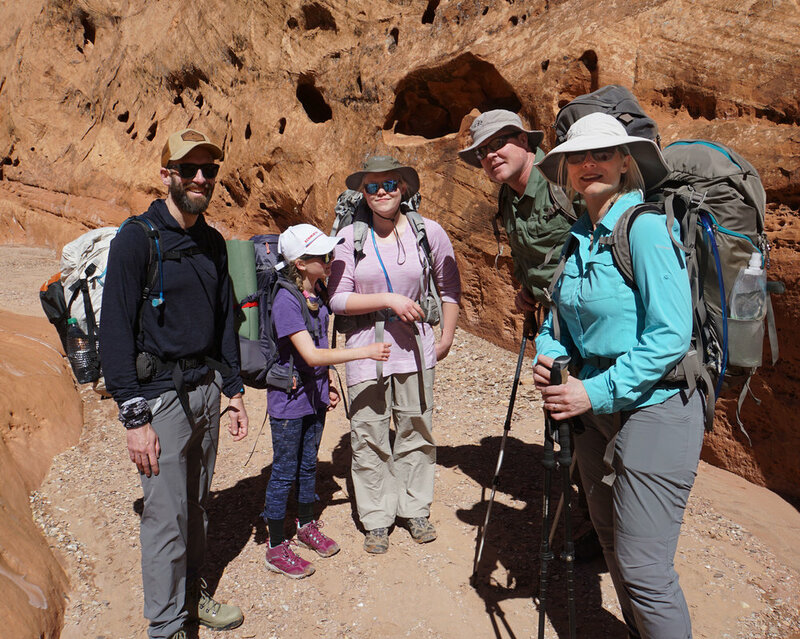 We sure lucked out with the weather on our three day backpack in Southern Utah’s Capital Reef. We hiked Muley Twist Canyon, a 22 mile route. The first day we each carried 5-6 liters of water. The 2nd and 3rd days there was water along the way. I’m talking mud holes, not flowing streams. The group was BSA Troop 100 from Boise, which included the girls troop and the boys troop, and 7 adults to boot. A lot of the hike was in spectacular rock cliff areas, such as below, and all of it was in the stream bed. Thomas Lea did me the favor of tuning up the above picture, and I’ll have a blog post soon about just what he did. In the picture below he took the easy way, and converted it to black and white. This made sense with this lighting, with flat light on the rocks contrasted with dark shadows in the stream. Shown below is part of our camp site the first night. We tried to get out of the streambed in case there were flash floods, but our concern was unfounded. It was pretty warm this night, and my 32 degree quilt was adequate. The next day we did a lot of miles, maybe 10, to the confluence of Muley Twist creek and Hall creek. We camped near the confluence, and it was COLD that night, maybe in the mid twenties.